InterNations has been given a rare opportunity to host its official event at the place-to-be-seen Balcon Beach Lounge @ Dubai Marine Beach Resort & Spa on Thursday, 14 February 2019. 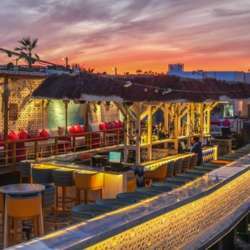 This extremely cool beach venue with a terrace offers Greek-style Tapas, signature drinks, and shisha - with a combination of live and DJ-driven music. However, because of the limited space at this venue, we will need to operate on a first come first served basis. We would therefore strongly advise you to come as soon as registration opens at 19:00. !! !The management of Balcon Beach Lounge has reiterated that all tables are fully booked after 10pm, AND advised that after 11pm, there is a minimum charge of AED 250, even for ‘standing' guests!!! As always, InterNations offers a wonderful opportunity to mix and mingle with people from all over the world and it's not unusual to have offer 80 nationalities attending our events. Please bring plenty of business cards to smooth the way for relationship building. If you'd like to bring friends or other guests to the event, they can register at the door and pay a 60 AED entrance fee. Credit cards are not accepted for the entrance fee. We look forward to seeing you all at this special venue - and remember, it's first to come first served.